These are the words we’ve waited to hear. Shortly before 12:30 AM (00:30) Tokyo time, the call went out: “core on deck; core on deck”. Scientists flocked to the catwalk to watch the first official core of Expedition 352 rise to the surface. Technicians moved into place: carrying the core to the catwalk; depositing it in the rack; wiping it off; marking and cutting sections. 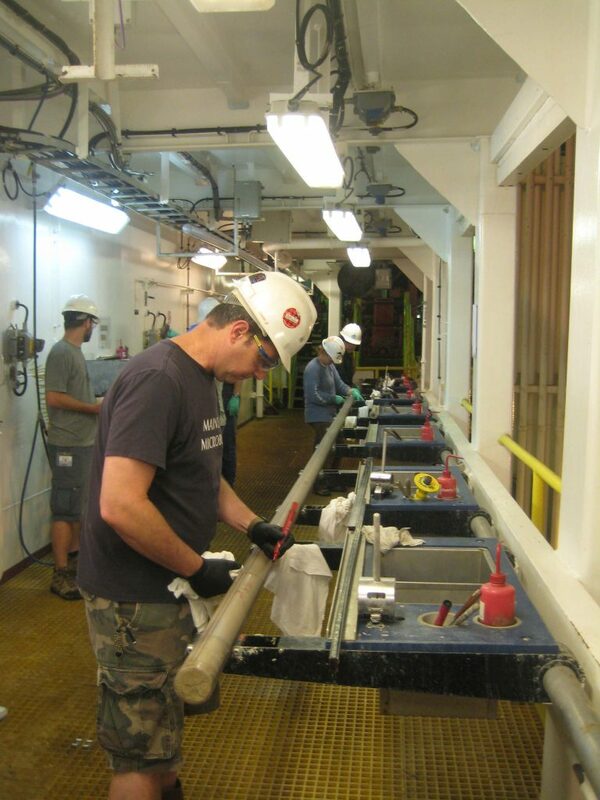 The IODP technicians fall into their roles naturally, moving and working together to get the job done while scientists look on with interest and curiosity about what is inside the liner surrounding the core. While initial tests and observations are begun, the waiting also begins as it takes approximately two hours for the core sections to equilibrate before observations can continue. In that time, another core should arrive on deck and the process (excitement then waiting) continues.